Toyohara Kunichika (1835-1900) Nakamura Shikan IV as Kato Kiyomasa, 1873. Oban. Possibly Kunichika’s most sought after print - very rare and a masterpiece of design, drawing, invention and expression. Even for Kunichika, it is rare to see such a lavish use of blocks and printings as in this tour de force of woodblock art. 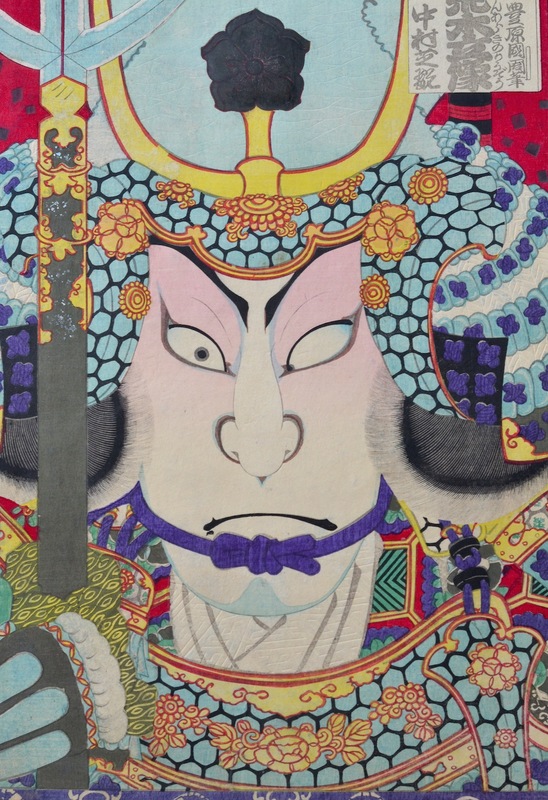 The print uses an obsessive amount of over printing, detail, carving and colour and yet retains an abstract, chaotic quality - allowing the ferocious, vengeful face of Kiyomasa (Shikan) to sit balefully at the centre of the print - the eye of the tornado as it were. It is an astonishing piece of work, stretching the art of portraiture to the limit - the features seem almost but not quite in need of rearrangement, and yet Kunichika here avoids slipping into caricature. Aside from the use of blocks, the print is deeply embossed with patterns and flecked with metallic flakes on the spear shaft. Kiyomasa was one of the great warrior lords (daimyo) of the 16th century. He fought with the great leader Hideyoshi and was a renowned builder of castles and fortifications. He comes down through history as one of the Seven Spears of Shizugatake. A ferocious man prone to punishing his men for dancing or reading poetry, he nevertheless devoted himself to Nichiren Buddhism in later life. In Japan he has been a figure of heroism and bravery for centuries and these qualities come through very strongly in this uncompromising portrait - which is both an homage to the actor but also to the the great general himself. 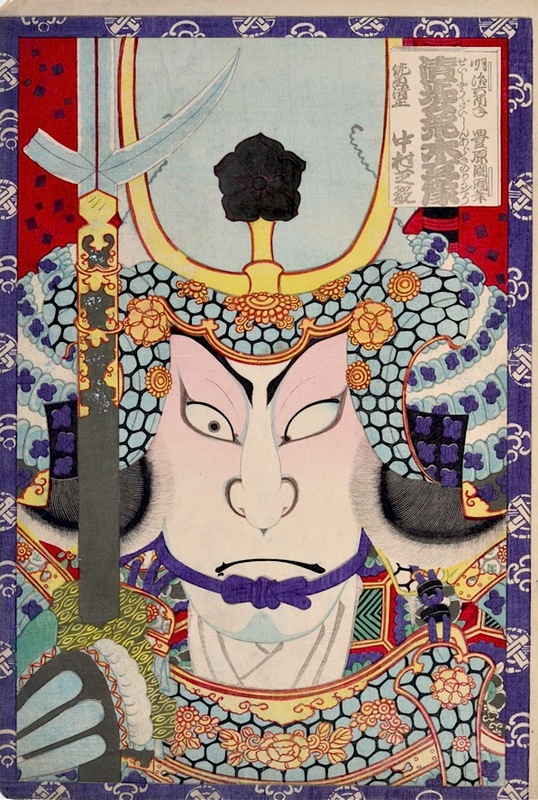 Shikan’s portrayal of the character is rendered by Yoshifuji in a print from 1867. The Yoshifuji print is far inferior but does give an insight into the staging of the performance, and the adoration of the kabuki fans. This is the masterpiece of this extraordinary series. The print is in mint condition, very fine colour and impression with embossing and metal flakes.